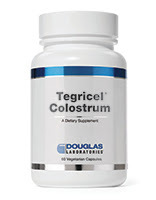 *The colostrums used for Tegricel® Colostrum are sourced from USDA Grade A farms in the US, and all reasonable efforts are made to ensure that farmers do not use artificial hormones or antibiotics in the dairy production. Suggested Use: Adults take 2 capsules daily or as directed by your healthcare professional. Children ages 4 and up that can safely swallow a capsule, take 1 capsule daily or as directed by your healthcare professional. Capsule can be opened and contents put into cold food. Note: Tegricel Colostrum does not dissolve in liquid.